In 2012, the NFL had a giant command center set up for the Superbowl, and massive bandwidth pumped through the stadium so people could share about the game live with their friends who weren’t fortunate enough to be there. They didn’t just watch to see what is said – over 20 people monitored to reach out proactively to help people with things like parking info, getting lost in the stadium, getting an answer to a question, etc. even though they have not been directly asked via Twitter or Facebook. This wasn’t push marketing – this was amazing customer service that greatly enhanced the experience. We used our Intefy product to set up a mini Tweet Command Center, that anyone could make their own just by logging in and tweeting while watching the search streams in the other columns. 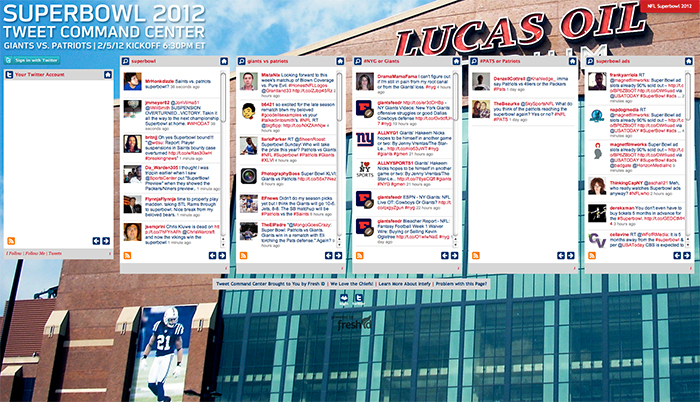 We love this use of Twitter still, and were tickled when some NFL teams shared the page.